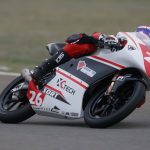 Canadian motorcycle road racer Jonathan “Jonny” Finn is pleased to officially announce that he has re-signed with the XCtech Team to contest the 2019 Spanish ESBK Pre-Moto3 Championship. 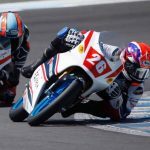 Jonathan continues to live and train in Spain in preparation for the newly named 2019 Campeonato de España de Superbike Cetelem or ESBK. He will be competing on a brand new XCtech prepared 2019 BeOn Automotive Pre Moto3 race machine that features 40 plus horsepower powered by a 2019 Yamaha YZ250F engine and weighing 82 kilograms. Jonathan is thankful for the support in 2018 from Canadian Tire – Cobourg, Arai Helmet Americas, Bickle Racing, Human 2.0, Impact Safe-T Armor, Marsquest, BigB Racing, VNM Sport, Moto World, RST-Moto, Infinet Motorsports and Vroom Media Ltd.